This is the second release in the new MITK release cycle. The complete list of new features, bug fixes and known issues is down on this page. There are binary installers for Windows, Mac OS X and Linux. 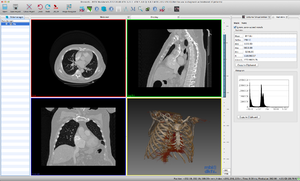 Additional to the basic plugins of our first release ( visualization, measurement and interactive segmentation) two new plugins are included: a new logging view and a experimental plugin for DICOM Import and Query/Retrieve based on components from the Common Toolkit CTK. The application itself was renamed from ExtApp to MITK Workbench. Please note that the installers do not contain the source code or header files for the precompiled libraries. To develop applications or plugins with MITK please get the source code. Event notification policy for the mitkGlobalInteraction. The GlobalInteraction class can now be told to inform only the one listener who can handle the event best. CanHandleEvent function for StateMachine. Like interactors the statemachine now has a CanHandleEvent function too. Renamed "transversal" orientation to more commonly used "axial"
In the 3 months since the last release more than 300 bugs were fixed. 12244 Change class structure of EnergyCalculator in Gibbs-Tracking. This page was last modified on 1 December 2014, at 15:35. This page has been accessed 24,488 times.